John D. Pierce was a farmer and the original owner of the property. In 1878, he sold the land to William S. Clark, the owner of a stove and hardware business located at 68 Main Street; in the American Block which burned down on 3/7/1893. He was married to Lenora (Thompson)(Hosmer) Clark who was a well known musician and they had this elegant home built by mail order plans from an architectural firm in 1888. The house was originally called The Woodleigh Villa. Also occupied by daughter Ada Lenora(Hosmer) Lancaster from 1904 until 1944, who was a music teacher and the widow of Thomas J. Lancaster. In 1919, Jacob Schick, who owned and operated the Ford Agency located at 47-49 Federal St. and his wife Isabelle occupied 220 Federal St. along with Ada Lancaster. 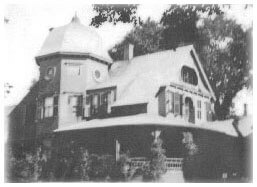 After Mrs. Lancaster's death, the Schicks adopted a type of boarding home for a few residents until Mrs. Schick sold to the Bulman Family in 1948. The Bulmans owned and operated the Victorian Home as a funeral home for four years until the property was purchased by Henry & Irene Kostanski and they established the Kostanski Funeral Home. After Henry and Irene's retirement, the funeral home was run by their children, Michael H. Kostanski, William R. Kostanski and Karen I. Larabee. The Kostanski Funeral Home is now owned and operated by William R. Kostanski, Karen Larabee and William's daughter, Britney K. Gioules.